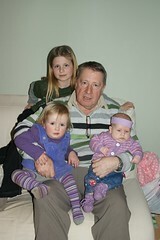 Mummy wanted a photo of Pumpa and all his granddaughters the other day. For some reason Anna put this weird hairband round my head. Hasn't she noticed I have no hair yet? I wish I could learn to coordinate moving my two hands - then I could take things like this off when Anna and Pudge do this to me!